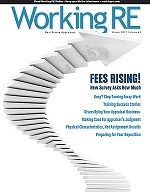 Editor’s Note: Most appraisers know how to be form fillers but an appraiser who is a good businessperson also, is harder to find. Here are some tips from the field. Here’s my response: “I’ve been through the exact pain you are talking about. One of the reasons I teach is to motivate other appraisers to increase their fees and quality of work/life. I have lost clients and it hurt my business. However, once the cheap/fast lenders were out of my life, I had more time and replaced them with better quality/higher paying clients. It wasn’t easy but then that’s where the BUSINESS side of appraising kicks in. Most appraisers know how to fill out a form but have NO idea how to run a business – which is why they are stuck with low-paying clients. In this profession, a little business sense goes a very long way. I’m not alone in making my business grow. Numerous other appraisal companies have followed these same methods and are all buried in high-paying appraisal business right now. Yes we lose many orders, I’d say 50 percent, but the ones we get, pay us nicely. In the past 60 days alone my firm gained two banks who are paying $600+ for standard 1004/UAD/MC. Why? They like our quality and the way we do business, especially the way we do business!! Provide GOOD appraisals (not average form filling but good). Do not accept low paying assignments. Hold out for high paying assignments. Train the puppy (AMC, lender or mortgage broker) to do the right thing. Business will suffer… at first but will become much better. Lenders, credit unions, banks and AMCs seek out our firm, our quality of appraisals and pay a higher fee. Follow the plan and make money doing the right thing. Our firm survives nicely off the bank appraisal business and the legal appraisal business that I’m known for. Our appraisal business has two major components: a) appraisals and b) the business of appraisals. Filling out a form is easy, running a business, in a business-like manner, is tough and that’s where most appraisers fail. Here are just a few simple business questions that every appraiser MUST know the answer to. How much business do you get from your website? How many people visit your website each month? Who is looking at your print advertising? Are your company brochures up to date? How many bankers have you personally met in the past 60 days? What sort of clients do you desire? Have you reached them and how do you know? List your advertising assets: which ones work, which don’t? 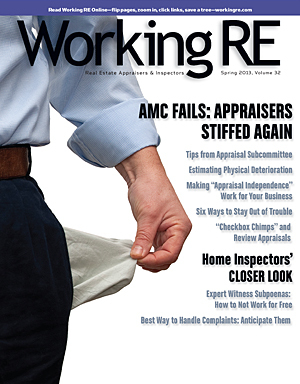 My guess is that most appraisers can answer very few of these questions. Yet, many complain that they have to accept low-paying AMC work. If you’re thinking, Richard, it might work for you but it won’t work for me, this area is different, think again. Through my courses and webinars I try to show appraisers how they can do better: there’s money out there and a higher quality professional life- go get it!